GCN/State & Local last week won a Jesse H. Neal National Business Journalism Award from the American Business Press for the best subject-related series of articles among publications of its size. 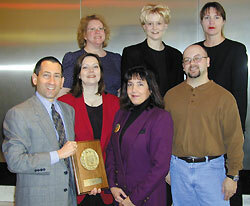 The September 1999 issue of GCN/State & Local was honored for its nationwide summary of year 2000 preparations at the state, county and municipal levels. The team that produced the issue included, front left to right, GCN editorial director Thomas R. Temin, GCN/State & Local associate editor Trudy Walsh, managing editor Vanessa Jo Roberts and graphic artist Michael J. Bechetti, and, top left to right, assistant managing editor Julie Britt, GCN/State & Local associate editor Claire E. House and associate art director Phyllis L. Maringer. Articles from the winning issue can be found at www.gcnstateandlocal.com.